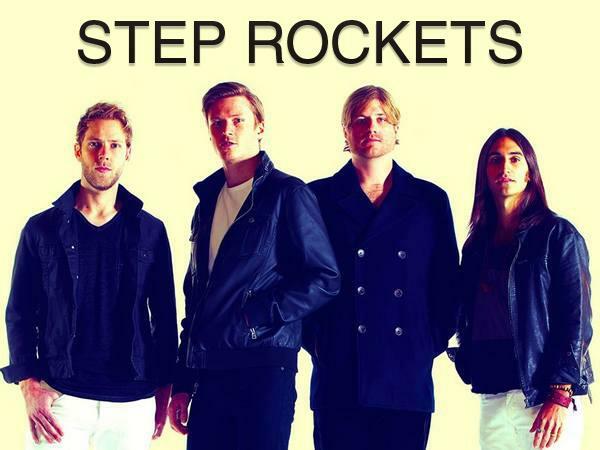 Join us this week as we welcome the Indie Pop band, Step Rockets. Hailing from Twin Cities, MN., it didn't take long for Step Rockets to take off. Their self-released single “Kisser” found its way to #1 on the Hype Machine charts just two weeks after its release despite virtually no publicity. The track has since garnered over 5.5 million plays on Spotify and catapulted the band onto the international music scene. With appearances at Firefly Festival, Summerfest, SXSW, CMJ, Canadian Music Week and a slew of other festivals and major venues across North America, Step Rockets have developed a reputation as one of the most exciting new live bands on the scene, seamlessly blending wailing guitar solos and anthemic melodies with infectious dance grooves. The band's music has been featured in TV shows and commercials, including placements in Showtime's Shameless and ABC's Cougartown. The band has released a collection of popular singles including "Kisser" and “Turning Tides (By Your Side)” – as well as remixes and videos – that all lead up to their highly anticipated debut EP, Future Nature, scheduled for an early April 2016 release (on Harbour/Caroline). Step Rockets will be on tour this spring in support of the new EP and the first single, “West Coast”. We will talk to Step Rockets about their upcoming schedule, get a behind their scenes look at their music, feature their latest songs, and ask them to share their message for the troops. Please be sure to visit Step Rockets at http://www.steprockets.com/ and spread the word. Fans are welcome to call in and speak live with them during the show (718) 766-4193. As always we will give shout outs to our deployed military listeners. Our message to the troops: WE do what we do, because YOU do what you do.